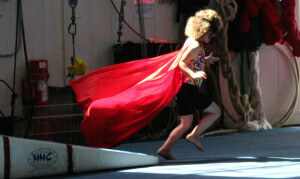 The Kidpower Coloring Books show children using key People Safety skills to keep themselves safe. 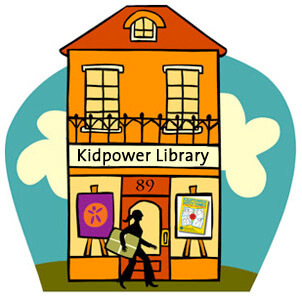 You are welcome to download the Kidpower Coloring Books and copy them for the children in your life for free, as long as you keep our name, contact information, logo, and copyright very clearly visible. Los Kidpower libros de colorante de mostrar a los niños el uso de habilidades clave Seguridad Las personas a mantenerse a salvo. 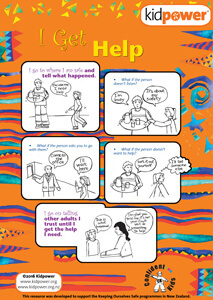 The Kidpower Coloring Books show children using key People Safety skills to keep themselves safe. De Kidpower Kleurboeken tonen kinderen met behulp van de belangrijkste Mensen Safety vaardigheden om zich veilig te houden . De Kidpower Coloring Books visar barn som använder Nyckelpersoner Säkerhets färdigheter för att hålla sig säker . Cele mai Kidpower Carti de colorat pentru copii arată folosind abilitățile cheie Oamenii de siguranță pentru a se menține în condiții de siguranță. Các Kidpower màu Sách cho trẻ em sử dụng những kỹ năng quan trọng an toàn dân để giữ cho mình an toàn. 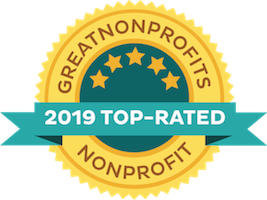 A checklist from Kidpower for parents to use to prepare kids with safety skills and knowledge - before they go anywhere without adult protection. 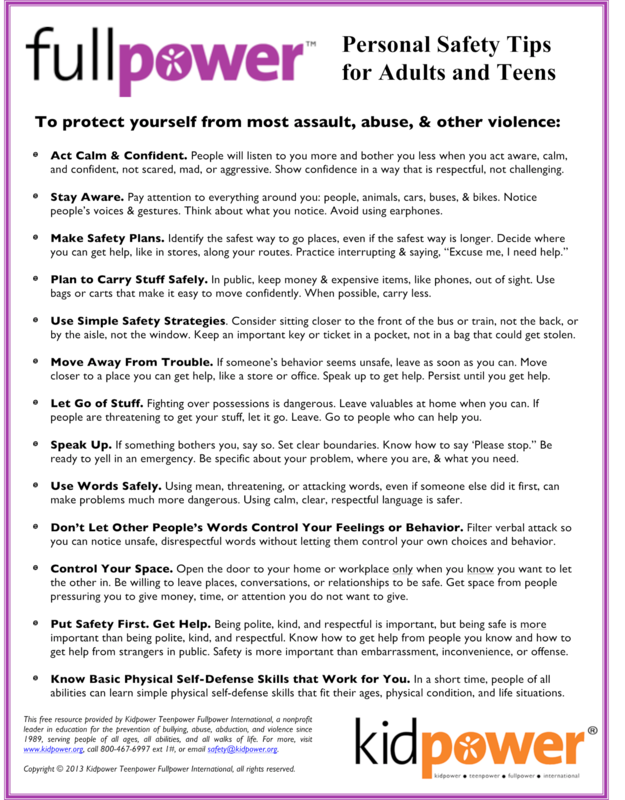 Use our safety tips for teens and adults to learn to be safe from abuse, bullying, harassment, assault, and other violence (English). Use our safety tips for teens and adults to learn to be safe from abuse, bullying, harassment, assault, and other violence (Spanish). Parents, teachers, and other caregivers can use this readiness checklist to prepare kids before they go out without adult protection (Spanish). 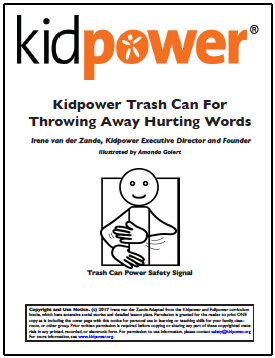 Use our Kidpower’s Safety Tips Handout to start teaching children how to be safe from abuse, bullying, harassment, assault, and other violence (Spanish). Use our safety tips for teens and adults to learn to be safe from abuse, bullying, harassment, assault, and other violence (French). Parents, teachers, and other caregivers can use this readiness checklist to prepare kids before they go out without adult protection (French). Use our Kidpower’s Safety Tips Handout to start teaching children how to be safe from abuse, bullying, harassment, assault, and other violence (French). Use our safety tips for teens and adults to learn to be safe from abuse, bullying, harassment, assault, and other violence (Chinese). Parents, teachers, and other caregivers can use this readiness checklist to prepare kids before they go out without adult protection (Chinese). 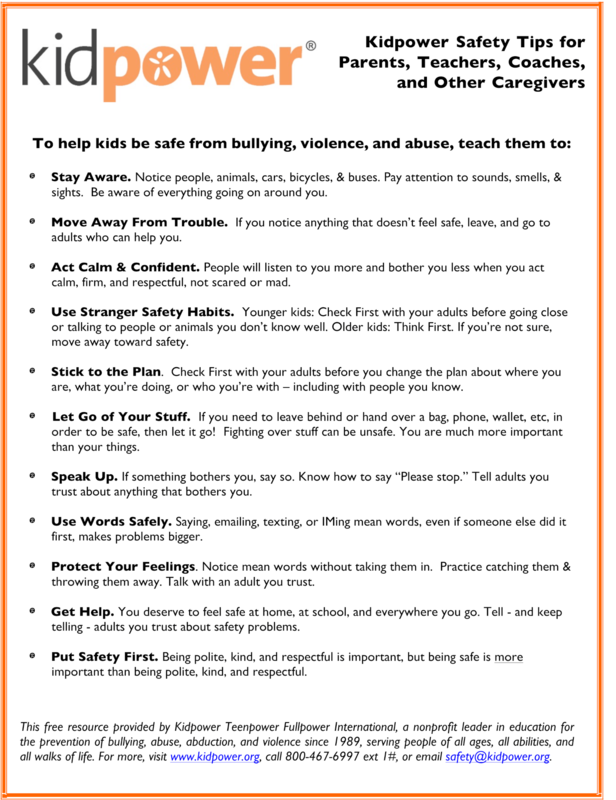 Use our Kidpower’s Safety Tips Handout to start teaching children how to be safe from abuse, bullying, harassment, assault, and other violence (Chinese). Use our safety tips for teens and adults to learn to be safe from abuse, bullying, harassment, assault, and other violence (Vietnamese). 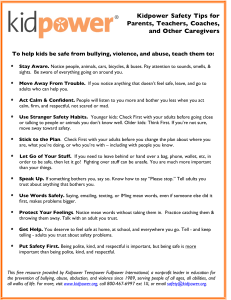 Use our Kidpower’s Safety Tips Handout to start teaching children how to be safe from abuse, bullying, harassment, assault, and other violence (Vietnamese). Use our safety tips for teens and adults to learn to be safe from abuse, bullying, harassment, assault, and other violence (Arabic). Use our safety tips for teens and adults to learn to be safe from abuse, bullying, harassment, assault, and other violence (Romanian). 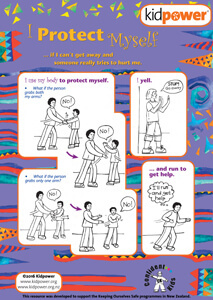 Use our Kidpower’s Safety Tips Handout to start teaching children how to be safe from abuse, bullying, harassment, assault, and other violence (Romanian). Use our safety tips for teens and adults to learn to be safe from abuse, bullying, harassment, assault, and other violence (Tagalog). 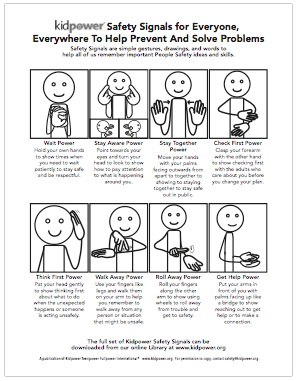 Kidpower Safety Signals define core personal safety skills and concepts through simple gestures, graphics, and explanations, making them easy to learn, remember, and use, especially for people with limited speech and young children (Spanish). Kids and adults alike often suffer from name-calling, taunting, rude gestures, pranks, and other cruel behavior because of their weight.The following recording and handout are thanks to Dr. Abby Bleistein, who is a board certified physician in Internal Medicine, pediatrics, and obesity medicine. Abby has a practice specializing in medically managed weight loss for adults and kids. She uses Kidpower to provide support and skills for her patients because they face a much higher risk of being bullied about their size. She includes this knowledge in her presentations on pediatric obesity at educational conferences for pediatricians. 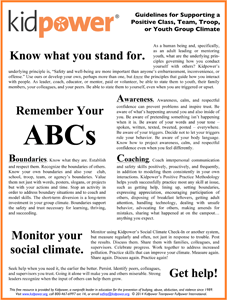 As a Kidpower Board member who has participated in our Skills for Child Protection Advocates Institute, Abby partnered with us to create a handout and plan for what health care providers can say and do to help protect their patients who carry extra weight in their bodies from bullying. Use our Kidpower’s Safety Tips Handout to start teaching children how to be safe from abuse, bullying, harassment, assault, and other violence (Swedish). Kidpower Safety Signals define core personal safety skills and concepts through simple gestures, graphics, and explanations, making them easy to learn, remember, and use, especially for people with limited speech and young children (French). 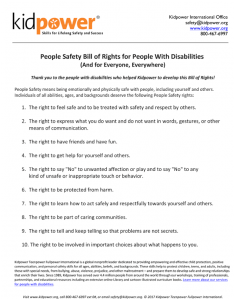 These Kidpower Put Safety First Commitment For Yourself Posters are a vibrant and compelling signal to show your commitment to your own physical and emotional safety and well being (English). The Fullpower Protection Promise for Yourself – from the Fullpower Safety Comics for Teens and Adults (English). The Kidpower Protection Promise for Younger Children (ages 3-10) from the Kidpower Safety Comics book (English). 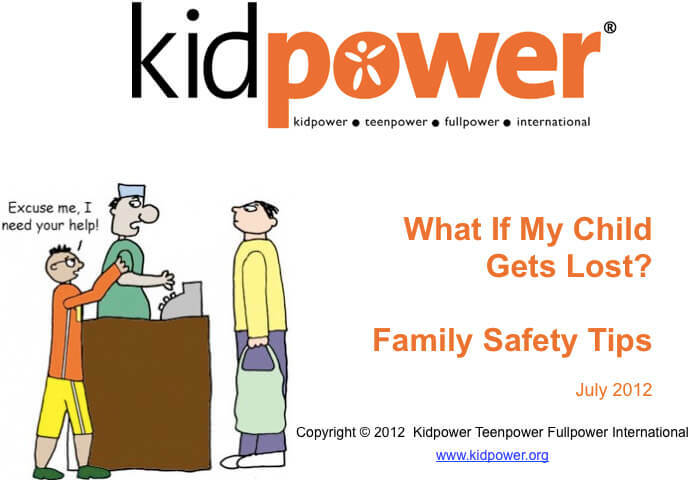 The Kidpower Protection Promise for Older Kids (ages 9-14) from the Kidpower Youth Safety Comics book (English). 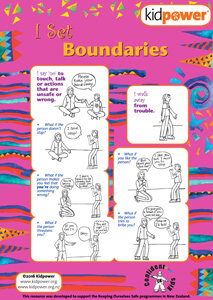 Make sure children KNOW that you care by discussing the protection promise with them – and use this poster as a reminder for everyone of the importance children’s safety and well-being (English). 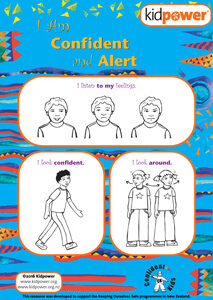 These Kidpower Put Safety First Commitment Posters are a vibrant and compelling signal to show your commitment to child protection as an advocate and partner to ensure their physical and emotional safety and well being (English). 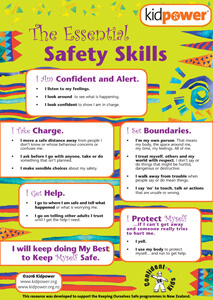 These Kidpower Put Safety First Commitment For Yourself Poster is a vibrant and compelling signal to show your commitment to your own physical and emotional safety and well being (Spanish). The Fullpower Protection Promise for Yourself – from the Fullpower Safety Comics for Teens and Adults (Spanish). The Kidpower Protection Promise for Younger Children (ages 3-10) from the Kidpower Safety Comics book (Spanish). The Kidpower Protection Promise for Older Kids (ages 9-14) from the Kidpower Youth Safety Comics book (Spanish). Make sure children KNOW that you care by discussing the protection promise with them – and use this poster as a reminder for everyone of the importance children’s safety and well-being (Spanish). 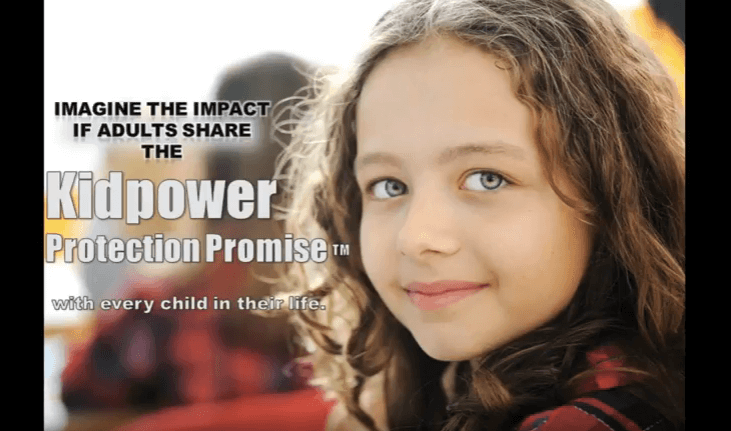 These Kidpower Put Safety First Commitment Posters are a vibrant and compelling signal to show your commitment to child protection as an advocate and partner to ensure their physical and emotional safety and well being (Spanish). These Kidpower Put Safety First Commitment For Yourself Poster is a vibrant and compelling signal to show your commitment to your own physical and emotional safety and well being (French). The Fullpower Protection Promise for Yourself – from the Fullpower Safety Comics for Teens and Adults (French). The Kidpower Protection Promise for Younger Children (ages 3-10) from the Kidpower Safety Comics book (French). The Kidpower Protection Promise for Older Kids (ages 9-14) from the Kidpower Youth Safety Comics book (French). Make sure children KNOW that you care by discussing the protection promise with them – and use this poster as a reminder for everyone of the importance children’s safety and well-being (French). These Kidpower Put Safety First Commitment Posters are a vibrant and compelling signal to show your commitment to child protection as an advocate and partner to ensure their physical and emotional safety and well being (French). The Fullpower Protection Promise for Yourself – from the Fullpower Safety Comics for Teens and Adults (Vietnamese). The Kidpower Protection Promise for Younger Children (ages 3-10) from the Kidpower Safety Comics book (Vietnamese). 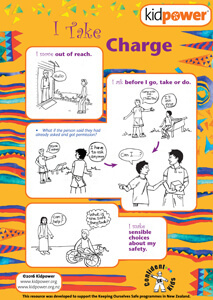 The Kidpower Protection Promise for Older Kids (ages 9-14) from the Kidpower Youth Safety Comics book (Vietnamese). Make sure children KNOW that you care by discussing the protection promise with them – and use this poster as a reminder for everyone of the importance children’s safety and well-being (Vietnamese). These Kidpower Put Safety First Commitment Posters are a vibrant and compelling signal to show your commitment to child protection as an advocate and partner to ensure their physical and emotional safety and well being (Vietnamese). The Fullpower Protection Promise for Yourself – from the Fullpower Safety Comics for Teens and Adults (Arabic). The Kidpower Protection Promise for Younger Children (ages 3-10) from the Kidpower Safety Comics book (Arabic). The Kidpower Protection Promise for Older Kids (ages 9-14) from the Kidpower Youth Safety Comics book (Arabic). Make sure children KNOW that you care by discussing the protection promise with them – and use this poster as a reminder for everyone of the importance children’s safety and well-being (Arabic). These Kidpower Put Safety First Commitment Posters are a vibrant and compelling signal to show your commitment to child protection as an advocate and partner to ensure their physical and emotional safety and well being (Arabic). These Kidpower Put Safety First Commitment For Yourself Poster is a vibrant and compelling signal to show your commitment to your own physical and emotional safety and well being (Swedish). The Fullpower Protection Promise for Yourself – from the Fullpower Safety Comics for Teens and Adults (Swedish). The Kidpower Protection Promise for Younger Children (ages 3-10) from the Kidpower Safety Comics book (Swedish). The Kidpower Protection Promise for Older Kids (ages 9-14) from the Kidpower Youth Safety Comics book (Swedish). The Fullpower Protection Promise for Yourself – from the Fullpower Safety Comics for Teens and Adults (Romanian). The Kidpower Protection Promise for Younger Children (ages 3-10) from the Kidpower Safety Comics book (Romanian). The Kidpower Protection Promise for Older Kids (ages 9-14) from the Kidpower Youth Safety Comics book (Romanian). Make sure children KNOW that you care by discussing the protection promise with them – and use this poster as a reminder for everyone of the importance children’s safety and well-being (Romanian). These Kidpower Put Safety First Commitment Posters are a vibrant and compelling signal to show your commitment to child protection as an advocate and partner to ensure their physical and emotional safety and well being (Romanian). These Kidpower Put Safety First Commitment For Yourself Poster is a vibrant and compelling signal to show your commitment to your own physical and emotional safety and well being (German). The Fullpower Protection Promise for Yourself – from the Fullpower Safety Comics for Teens and Adults (German). The Kidpower Protection Promise for Younger Children (ages 3-10) from the Kidpower Safety Comics book (German). The Kidpower Protection Promise for Older Kids (ages 9-14) from the Kidpower Youth Safety Comics book (German). Make sure children KNOW that you care by discussing the protection promise with them – and use this poster as a reminder for everyone of the importance children’s safety and well-being (German). 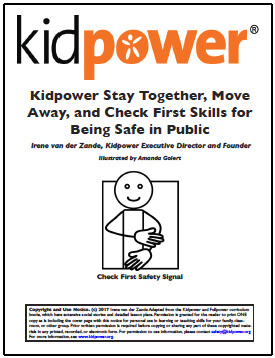 These Kidpower Put Safety First Commitment Posters are a vibrant and compelling signal to show your commitment to child protection as an advocate and partner to ensure their physical and emotional safety and well being (German).